Let's get down and dirty...Boiling Crab style! Er, we don't know, probably one? Sorry. That was a dare to have a completely unrelated and horrible opener to our article. We think we did well in doing poorly. Anyways, um, yeah--Boiling Crab! If you like to get down and dirty with your food but still have a deliciously fun time, then Boiling Crab is the place to be. It is so fun to eat here. Once you sit down and order, you get fitted with a Boiling Crab bib and then can squirt ketchup all over the table (with a wax paper covering--come on, gotta be hygienic here) with any kind of design you want. The walls have tons of TVs and Sharpied names of all the guests that have eaten here in the short while it's been opened. 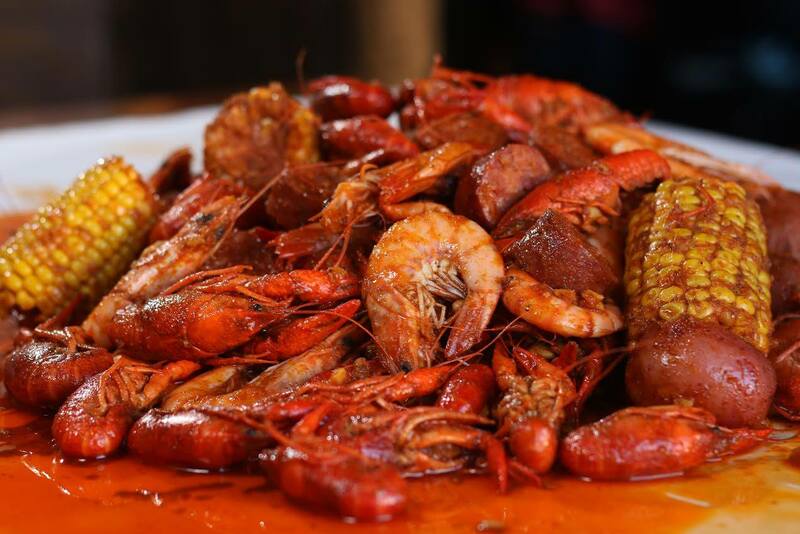 Then, if you ordered seafood--and we're guessing you did or else why are you really here?--they dump a bunch of limes on your table and then serve your bags of crawfish or shrimp or crab or whatever you got! What do we like? We LOVE the pound of shrimp, whole she-bang (all the great sauces in one) medium (spiciness) with a side of cajun fries. We also love throwing in corn in the cob with sausage or some cajun rice. Oh man, we're getting sooo hungry just writing this! Of course, they have other items on the menu like gumbo or fried fish and chicken; you don't HAVE to love seafood to come here (we were being mean before. We apologize). And yes, they have beer! Overall, Boiling Crab is so popular because it's delicious cajun food that isn't terribly expensive. It's fun to eat here with your friends, and it's fun to get a little dirty. The downside? Ugh, the wait! Boiling Crab IS insanely popular as we said, and while the restaurant is fairly large, there is commonly lines here to get a table. Expect at least 20 minutes to even an hour at peak times. All the more reason to go with friends so you can at least fill the time with some good conversation. Overall, though, Boiling Crab is one of the best dining options in crowded Westwood. If you've never been, then we say take a stop by. Maybe you'll learn to screw in a lightbulb. Bam! Tied it in with our opener. Our high school English teachers would be proud.